Step Seven (Student and Parent): Read, sign and date. If you are the student, by signing this application you certify that you (1) will use federal and/or state student financial aid only to pay the cost of attending an institution of higher education, (2) are not in default on a federal student loan or have made satisfactory arrangements to repay it, (3) do not owe money back on a federal student grant or have made satisfactory arrangements to repay it, (4) will notify your college if you default on a federal student loan and (5) will not receive a Federal Pell Grant from more than one college for the same period of time. If you are the parent or the student, by signing this application you certify that all of the information you provided is true and complete to the best of your knowledge and you agree, if asked, to provide information that will verify the accuracy of your completed form. This information may include U.S. or state income tax forms that you filed or are required to file. Also, you certify that you understand that the Secretary of Education has the authority to verify information reported on this application with the Internal Revenue Service and other federal agencies. If you sign any document related to the federal student aid programs electronically using a personal identification number (PIN), username and password, and/or any other credential, you certify that you are the person identified by that PIN, username and password, and/or other credential, and have not disclosed that PIN, username and password, and/or other credential to anyone else. If you purposely give false or misleading information, you may be fined up to $20,000, sent to prison, or both. If you or your family paid a fee for someone to fill out this form or to advise you on how to fill it out, that person must complete this part. Why are they asking this information? In the Sign and Submit section, you are essentially verifying that you had knowingly and willfully submitted the information into the application to the best of your knowledge. In the next three fields, you must enter your full Social Security number, Full Last Name, and date of birth. Next, you will select the “Sign” button which will sign your FAFSA electronically using your FSA ID number. Finally, you will select the “Submit my FAFSA now” button, which submits the completed application. You will immediately be directed to a confirmation page, which is also sent to you by email. 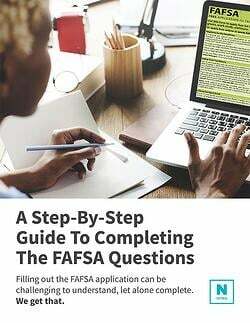 Please check back shortly as we are currently updating this step-by-step guide for the 2019-2020 FAFSA.